Welcome to a history of Shenyang's trams in three parts. The 1950s were perhaps the best and worst decade for trams in Shenyang. Trams made up 60% of the city’s total public transportation use and ridership was incredibly high. The total length of the network had been expanded to over 28km as a seventh route was opened. Shenyang also boasted a diverse collection of roughly 170 trams, both domestic and imported. By 1958 Shenyang had the largest number of trams in operation out of any city in China at that time. Unfortunately, some of the problems that impacted the earlier horse drawn tramway began to impact the electric trams. Shenyang roads (from over a hundred years ago and still to this day) had not seen any improvements when it came to rain drainage. Winter was also a great challenge as heavy snow brought trams to a halt and blocked traffic on busy streets. Despite Shenyang having the largest fleet of its day, overcrowding was still an issue; during rush hour people would sometimes be hanging onto the front, sides, and back much like the popular images of Indian commuter trains. In response to the traffic and overcrowding issues, trams got their first big competitor in 1951: the trolley bus. At first they ran in harmony but, as time went on, the buses began to look more promising. Not only were they more reliable in the winter, a factory producing them in Shenyang was creating an excellent boost to the local economy as more jobs opened up. 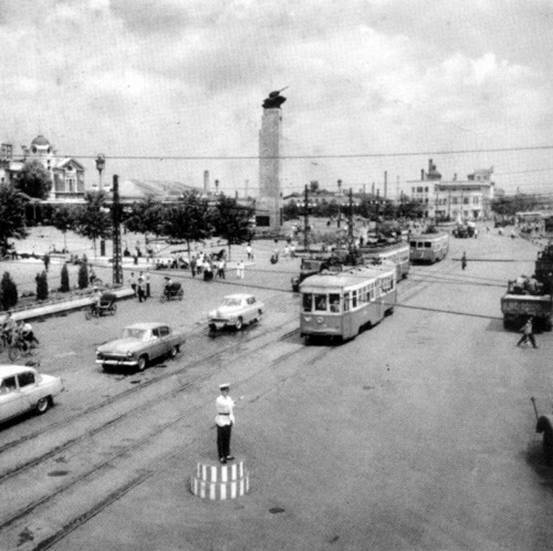 In 1964 the first reduction of Shenyang’s tram service to in nearly 40 years saw the less used routes replaced with trolley buses. For the most part, Shenyang’s tram service continued to operate without further cutbacks until the 1970s when the local government decided to entirely replace Shenyang’s tram lines. The first major routes to be removed were in Heping and Tiexi; nearly 200,000 workers were mobilized to remove the tram tracks and adjust the wires to accommodate the new buses. The last tram line to be removed was the most iconic: the route from Shenyang Zhan to the West Gate. Disassembly began on July 3rd, 1974 and was completed by the October 1st National Day. The event was marked with the inaugural run of a new electric bus, built in Shenyang, leading a parade down the route. No trace of the original tram tracks remained. The replacement of the trams was not entirely a success. For starters, the operation costs of the trolley buses cost the city a great deal more in operation expenses. Whereas the trams only cost approximately 70rmb per 100km to run, the buses sometimes cost as much as 300rmb per 100km due to the oil costs. This massive cost difference meant that Shenyang had to rely on government subsidies to support its bus network, a requirement it never faced in the era of trams. Another major issue not unknown to the denizens of North American urban centers is the increase in smog as the trolley buses inevitably gave way to diesel. Nearly 40 years after the removal of its original tram lines, the Shenyang government once more turned to the use of trams in 2013. The modern route is 70km long and features 65 stations. The trams themselves have been nicknamed “dolphins” due to their shape and appear in either white or blue. They can reach a maximum speed of 80km/h, though witnessing such speeds is a rarity (some parts of the line run at speeds slower than bicycles for “safety reasons” despite having a dedicated lane isolated from traffic). The full story of Shenyang’s trolley buses will be explored in more detail in a future series. For now I hope you have enjoyed an exploration of Shenyang’s fascinating tram history.